People’s wedding entrances and dances are constantly trying to outdo each other, and YouTube is full of them. But this one is a knockout! This wedding entrance is pretty special. The bridesmaid and groomsman enter through the door, holding hands and dancing badly. They get to the dancefloor, and while the girl dances about, the fella engages in some amateur gymnastics. After a short run up and a cartwheel, the groomsman finishes with a big backflip, which would be impressive if he landed it properly. 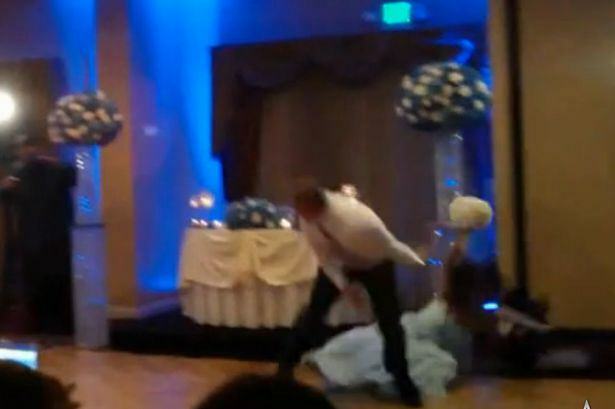 Instead, he kicks the bridesmaid in the head, and knocks her out. She hits the deck hard, taking some of the flower arrangement with her. People rush to help her up, but she falls flat on her face again, a bit like a boxer or UFC fighter after a beating. The best bit of the video is the way the groomsman is bobbing to the music while picking her up. Yeah mate, it all looks great, nobody noticed, just bob and it’ll be fine!